John McGlynn says leading the attack is the teenager’s best position. 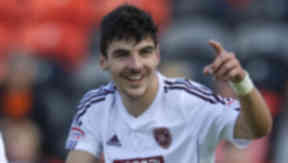 Hearts manager John McGlynn says he will continue to play Callum Paterson as a striker after the teenager scored a brace in the 3-0 win over Dundee United. Paterson has played at right-back and in midfield this season having come through the club’s academy as a forward. 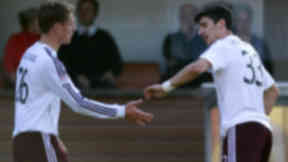 The 17-year-old scored a goal in each half as Hearts ran out easy winners at Tannadice. And McGlynn was thrilled with Paterson’s contribution, saying: "It's great for him. I felt he could have scored two goals last week and got himself into great positions. "It was a great strike with his left foot and the second one, I have seen those missed when the angle is narrowed. "I'm delighted for him. He caused problems for their defence all afternoon and was a handful to play against." After starting against St Mirren last week, Paterson looks like to keep John Sutton out of the side. McGlynn added: "Callum came to us as an attacking player from Tynecastle Boys' Club two seasons ago. In that time he has played wide right in midfield and also went back and played at right-back and centre-back for the youth teams. "In the close season I spoke to the backroom staff about what we had and obviously we are short of strikers. "I wanted to get Ryan McGowan into midfield so I played Callum at right-back and he did well, but you could see he was maybe a wee bit suspect defensively. "We pushed him further forward into midfield and he did very well. We have not got many strikers so we put him up front. "He has caused problems and could have scored four goals. "I would suggest there is good evidence to keep him up there."